Help the chameleon to hunt its' lunch. 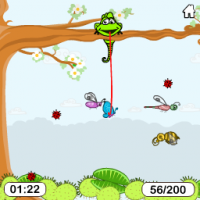 Collect the maximum number of bugs and reach your target point. Avoid the red thorn-ball or you will loose points.